Steedman leads his division off the ridge and begins marching toward McFarland Gap. The Federal units also begin their withdrawal from Horseshoe Ridge. The brigades of Stoughton and Walker silently make their way off the ridge to a point behind Snodgrass Hill. 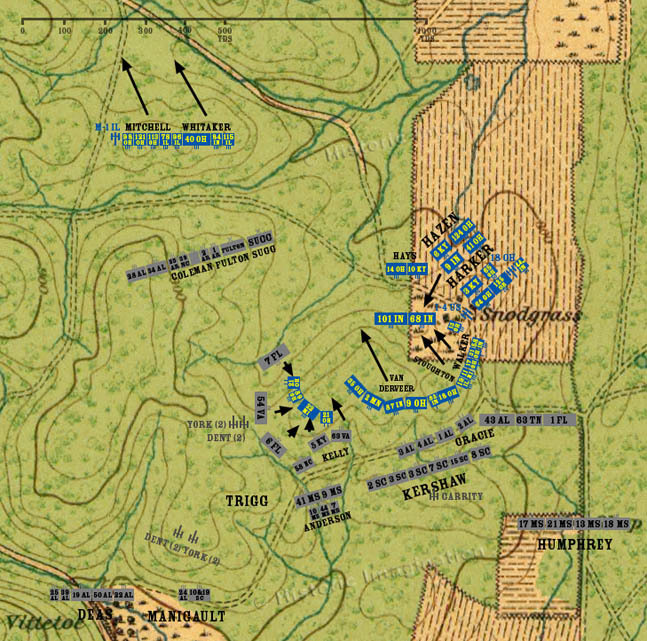 Van Derveer’s brigade moves to the bottom of the ridge, leaving the 35th Ohio behind as a rear guard. General Hazen sends the 9th Indiana to the ridge to support the 35th Ohio. Trigg’s and Kelly’s Brigades begin their slow advance up the slopes of Hill Three.